The international music industry is looking to Norway to learn the secrets of streaming, a technology that lets the user listen to music directly from online libraries. According to recent research, Norwegian consumers stream music more eagerly than anyone else. 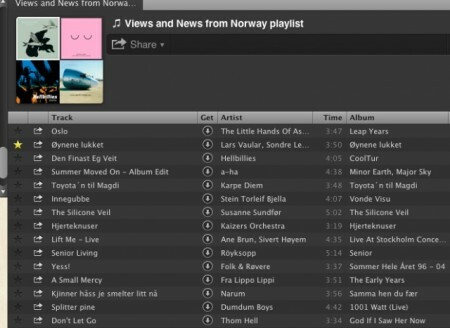 A playlist created by Views and News on Spotify, a large Sweden-based streaming service which features numerous Norwegian acts and is also wildly popular with Norwegian listeners. A new report found that 48 percent of Norwegians and 43 percent of Swedes have started using music streaming services such as Spotify and Wimp. Both services are growing rapidly both in terms of customers and in music on offer. Streaming is different from downloading music in that no files are transferred to the user’s computer. Instead, the user selects a song or a playlist from an online database, which is then played directly over the internet. Composers and performers are watching too, and are often disgusted. Many musicians complain that they only earn pennies from allowing streaming services to feature their songs and albums. But some admit they have no choice, as traditional income from CD sales is rapidly declining. In the first half of 2012, CD sales fell by 11 percent in Norway from the same period last year. Meanwhile, total music sales increased by 21 percent, according to Ifpi, an industry association. Spotify is active in seven countries including the US and the UK, and says it has 3 million subscribers who can access unlimited music for a monthly fee. Spotify also has 10 million users of its free service in which music is mixed with advertising. Wimp, owned by media giant Schibsted, telecom firm Telenor and the music retailing chain Platekompaniet, recently said it has 350,000 subscribers in Norway, Denmark, Sweden and Portugal. “Norway and Sweden are showing the world what can be achieved when a large proportion of the population embraces streaming,” said Karim Fanous, head of research in Music Ally of Britain. He told Dagens Næringsliv that the two Nordic countries are the idols of the streaming economy. “In particular, it’s impressive that Sweden has made the transition from being the homeland of Pirate Bay to representing a vision of the music industry’s future,” said Fanous. Spotify users may access our special playlist pictured above.